Fortune today released its annual "Fortune 500" list, a high-profile ranking of the largest companies in the United States ranked by revenue. In the new rankings, Apple has risen to #6 from its #17 spot in last year's rankings. Apple is bigger than ever -- the company cracked the Fortune 10 this year. But it’s a high-pressure job, being king of the hill. At Apple's press event this past October, it maintained more than disrupted with its software upgrades and iPad mini announcement. Also, this past year has seen a lot of CEO Tim Cook having to apologize -- once in September for the failure of Apple’s maps app, and then to Chinese consumers this April for slow repair services -- this in a market that Cook said this past January would be Apple's largest. Still, when every executive wants to invent the iPod of ___, Apple remains an innovation icon. Wal-Mart edged out ExxonMobil for the top spot in this year's rankings, with Chevron, Phillips 66, and Berkshire Hathaway also ranking ahead of Apple and its $156.2 billion in revenue. In looking at profits, Apple ranked second among Fortune 500 companies at $41.7 billion, trailing only ExxonMobil at $44.9 billion. The Fortune 500 is nothing more than a showplace ranking, an antique. Wal-Mart posted nearly three times the revenue of Apple, but Apple is more than twice as profitable. 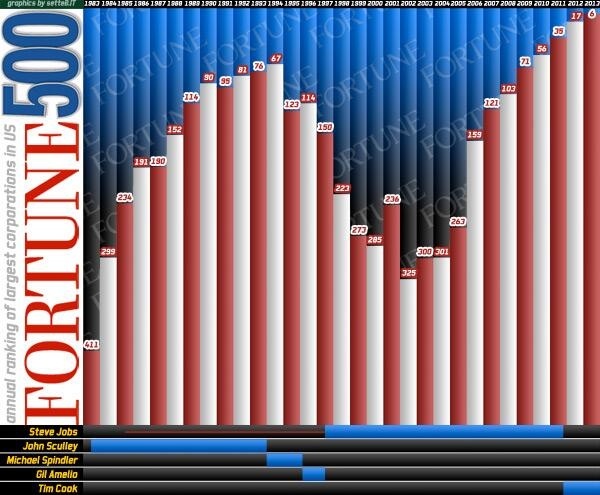 The Fortune 500 list is a list of the top 500 companies by REVENUE. It's a list of companies you are most likely to be a customer of. It's something that companies strive to be a part of. It generally means that you are a big, successful company. Of course, Apple is the 2nd most profitable company, but that doesn't mean squat, because, of course, they are doomed. Therefore, a list of the top 500 companies by PROFIT would just be a showplace, an antique. I'd love to see them all ranked by profit. Apple would be near the top if not the top there. To me profit means more then raw revenue does. The full list can be sorted by profit. It puts Apple in the #2 spot ($41.7b) after ExxonMobil ($44.9b). Number 3 is Chevron, at $26.1b. Of interest to me is that these oil companies are as large as they are today due to mergers. Apple has never merged with any company, nor has it even taken over any significantly large company. They've built the company the old-fashioned way -- from scratch. Under Steve Jobs, "disruptions" were years apart.